distribution Throughout the Coastal Plain -- except perhaps absent along parts of the immediate coast -- westward to the central Piedmont; thus, the eastern half of the state, plus a scattering of mountain records. Interestingly, Paulson's (2011) range map shows the entire state within the range, as the species is present throughout the eastern half of the country. With the recent mountain records, it must be assumed to occur in the intervening western half of the Piedmont, as well. A recent (2018) sight record, of five individuals, from Alleghany County is the only record for the northwestern quarter of the state. abundance Despite records for most of the counties within the range (52 counties), we have barely 20 recent records. Thus, it seems to be uncommon over the eastern Piedmont and most of the Coastal Plain, and likely is rare in many areas close to the coast (where there are no records for most counties that border the coast). Very rare in the southern mountains, and absent to very rare over the northern mountains and the western Piedmont. flight The flight period in both the Coastal Plain and the Piedmont is from early May to late September. The relatively few mountain records fall between mid-May and mid-August. habitat Ponds and lakes with emergent vegetation, including marshes. It also occurs along slow-moving streams, as long as marshy vegetation is present. comments The relative scarcity of recent records, especially in the Coastal Plain, is puzzling. 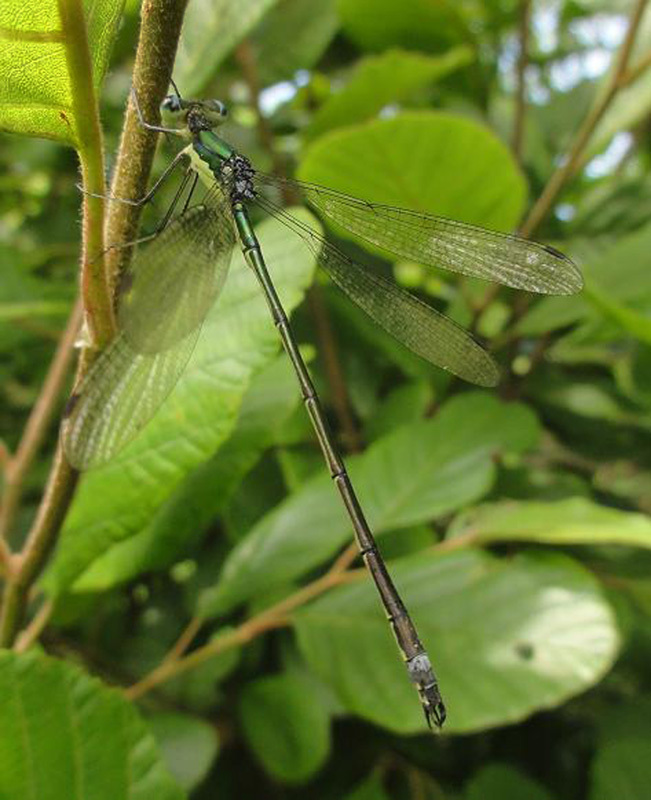 Perhaps it is being overlooked, but there are also few biologists currently working in the Coastal Plain, especially on damselflies, and particularly in the northern half of the province. Comment: Warren, 2009-07-15, - female, Hubquarter Creek, Lake Gaston. same individual as 477. Comment from Dennis Paulson: "Sometimes it's difficult to distinguish between L. vigilax and L. inaequalis. One of the field marks is the underside of the ovipositor, dark in inaequalis and pale in vigilax. From that alone, yours should be inaequalis. Another field mark is that inaequalis has the outer side of the tibiae pale, and that is evident in the front leg on the side view. L. inaequalis often has a brighter metallic green thorax than vigilax."